Since 1972, Seattle has installed 34 rightsizing road projects. Thirteen of these projects have been installed since 2007. Seattle’s planners note the importance of rightsizing their streets to help the 16% of the city’s households that lack a car and to improve safety and access for seniors, youth, transit riders, and those getting to and from cars. The Seattle Department of Transportation identifies corridors to be rightsized based on Bicycle and Pedestrian Master Plans, planned road capital projects, and community requests to implement neighborhood plans. In designing a project, the agency considers traffic operations, safety and collisions, livability, accommodation for freight and transit, parking, pedestrian crossing infrastructure, pavement conditions, and traffic signals. Stone Way North in Seattle was rightsized between North 34th and North 50th Streets. Its adjacent land use is mixed, including residential, retail and commercial space. Nearby pedestrian generators include eight schools, two libraries, and five parks. The 1.2 mile corridor also includes a number of bus routes. This project leveraged an existing repaving plan and was part of the implementation of the Bicycle Master Plan. The redesign resulted in dramatic safety gains, increased bicycling, and negligible impacts to motorized vehicle mobility. Additionally, the street saw significant new development, and is livelier. Four lanes were converted to two moving lanes, plus one two-way left turn lane. Bike lanes and sharrows were added to the street. Marked pedestrian crossings were made compliant with federal guidelines. Bicycle traffic increased 35%, comprising nearly 15% of the peak hour traffic volume. Vehicular traffic volumes were consistent with citywide trends and were not diverted to surrounding streets. Average daily automobile traffic dropped 6% at North 42nd Street, which was consistent with the citywide trend for arterials between 2006 and 2008. At North 42nd Street, overall volumes decreased 15%, while peak-hour volume dropped less than 5% and off-peak volume actually increased 2%. 4 non-arterial alternative routes were measured and vehicle volumes on these routes actually declined between -12 and -34 percent between 2007 and 2008, indicating that traffic diversion did not occur. Speeding declined. The speed limit is 30 mph. Rightsizing resulted in the 85th percentile of vehicle speeds dropping from 37 mph to 36 northbound and to 34 mph southbound, with 40+ mph vehicles dropping from 4% to 1% of traffic, which reduces the seriousness of collisions and injuries. Total collisions declined 14%. Injury collisions declined 33%. Angle collisions declined 56%. Pedestrian collisions declined 80% from 5 to 1. The number of bicycle collisions did not change, but the rate declined because ridership increased. * Seattle DOT collected before measurements for the period between April 5, 2005 and August 6, 2007. The After measurements were from August 7, 2007 to December 4, 2009. 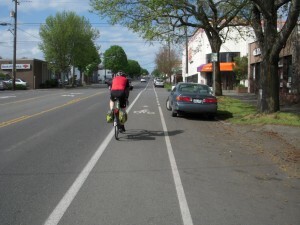 After local chamber of commerce opposition threatened to cancel a portion of the project, the bicycle activist community in Seattle vigorously supported the full implementation of the project. Activists organized traffic counts and a demonstration ride, and commissioned an outside consultant report that asserted that undue congestion would not occur, which was proven accurate, after their efforts helped support the decision to implement the full length of the project. Stone Way North was already slated for repaving, making it relatively easy and inexpensive to alter markings. Uncontrolled marked crosswalk guidelines changed in 2004 such that the existing uncontrolled marked crosswalks on Stone Way would have been required to be removed regardless of whether the road was otherwise altered. The rightsizing was implemented in two phases. Phase I took place in August 2007, between North 40th Street to North 50th Street. Phase II took place in April 2008, between North 34th Street and North 40th Street. The project was consistent with the mandate for bicycle lanes on this corridor in the 2007 Seattle Bicycle Master Plan. A Seattle DOT Presentation on their Experiences with "Road Diets"